The SMWS has a super-premium range called the Vaults Collection. These whiskies are rare, well packaged, and accordingly priced. 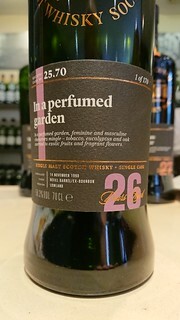 Some members have disliked this new tier of whiskies - although it should be noted that the bottles sold well. And the Society did decide to allow members to buy 10ml samples at the venues for reasonable prices, which takes a lot of the sting out of it - you may not be able to buy a bottle, but you can at least try some. Naturally, even though these bottles are out of my reach, I still write tasting notes for them!